Uploading products to Magento via the product upload sheet can be a great way to save time rather than adding each product one by one in the admin panel. There are several ways to upload products to Magento. You can do it through the standard import feature, the data profiles feature, or install the Magmi Magento extension that adds more product data import functionality. For the purposes of this blog post I am going to focus on the standard import feature because that alone is a difficult feature to navigate and can be difficult to learn quickly without guidance. To understand the upload feature, you must first understand how product, category, and attribute data works within Magento. I have written three blog posts covering each of these topics that should help you understand how to manage product data in Magento so that you understand these topics before you upload your products via the product excel import feature in Magento. We will be coming out with more Magento resources to help eCommerce businesses and Magento developers learn Magento better. 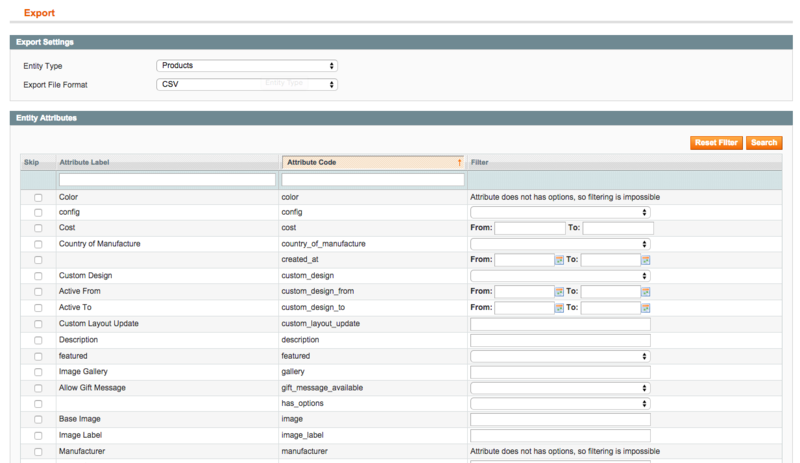 You have to create your attributes and attribute sets within Magento to upload your products to Magento. For Instance, if you want to upload a bunch of configurable products with Magento, you will need to create the appropriate attributes and attribute sets for that product to be configurable. In other words, if your products have different sizes, size will have to be an attribute and the right attribute values within size will have to be created otherwise you cannot upload that product within excel to Magento. To learn more about attributes and attribute sets read our blog on managing attributes and attribute sets in Magento. If you want all of your products to go to the right categories you want on your Magento store, you have to set them up in the admin panel. The standard Magento import product feature will not create categories dynamically, therefore the categories must be setup in the Magento admin panel first. You must assign your products in the excel sheet to go to the categories you want them to go to. For more information on setting up categories read our blog on managing categories in Magento. Here you can add new websites, stores, or store views. Once those are created you can assign your product data to the appropriate website, stores, and store views. To learn more about how managing multiple websites, stores, and store names work, Magento has a lot of information on this topic. The best way to get a perfect example of the excel format you need to upload your products to Magento is to manually create a few products. I would create ones with each attribute set you will want, each different type of product you will want (simple, configurable, Grouped, Virtual, bundled, or downloadable) so that you can get a sample excel of all the different variations of product data you will need to import. Keep in mind, bundled, and downloadable product types cannot be uploaded via the import feature. 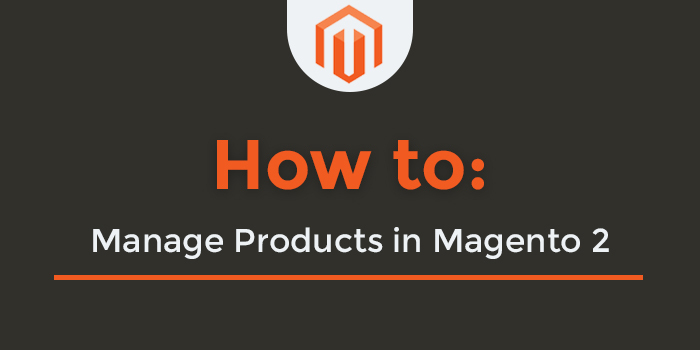 Magmi, the Magento import extension, can handle bundled product imports. The reason this is such a tricky feature in Magento to easily explain is that every excel format is going to be different depending on the custom attributes, custom attribute sets, custom options in each product, and product types you create for your specific product data set in your Magento eCommerce store. Therefore the easiest way to get a sample excel format for your product data to be uploaded to Magento is to create 10 or 20 products that have all the attribute set and product type variations that you will need and then export that data. You will want to hit continue and not skip any attributes unless you are confident you do not want to upload that attribute data for any of your products. Here comes the hard part. Building the excel sheet for all of your products or new products you want to update. 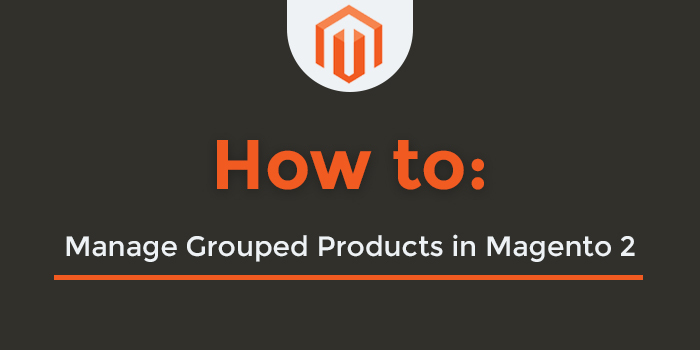 There are six product types as I explained in the managing product in Magento blog. If you export the excel sheet having created no custom attributes or attribute sets, you will still have to fill out the data for the default 42 core Magento attributes such as sku, description, name, short description, image, and more. THE EXCEL MUST BE WINDOWS COMMA SEPERATED FORMAT! Some of the attributes will be straight forward, such as the _attribute_set column, which simply allows you to apply whatever attribute set you want to that product. However, others, like custom options, are much more complex. I will not be able to go into each core attribute for this initial post, however I may do that if I have more resources to invest in this tutorial / blog. If you go to the attributes in the Magento admin panel, the left column attribute code is what is used in the excel columns that will be the attribute you want uploaded to Magento. Simple products are the easiest excel format to follow. If you only have one value per attribute you will only need one row per simple product. However if you want to assign one simple product to multiple categories or multiple values of one attribute than you will be required to add multiple rows for those values. You can see how the multiple category values are used in this screenshot on sku simple2, where multiple categories are applied to that product. You only need to fill out multiple rows of data for the one column that has multiple values. If there is not multiple attribute value data for that attribute or column you can leave that row empty. You will notice that some columns are related to each other like, custom_option_type, custom_option_title, and custom_option_is_required. This means that this attribute or section of the product data has multiple fields that need data to be entered. For instance you need to select what the custom options types are, whether they are required, what the titles for those options are, and more. There is often a sort order associated with an attribute or piece of data such as related products as well. You should see a import successful message if the import worked. Once your import is successful you will not immediately be able to see all your new data. Refresh the page and you will get a Index Management warning. Click the index management link to update your data in Magento. You will have to reindex the Product Prices, Category Products, and Catalog Search Index to see your new product data. Once your Index is complete go through your products in the admin panel and the front end of your website to see if everything worked properly. Debugging Magento product data is one of the most frustrating things you will encounter when dealing with Product data. When you upload your CSV to the import feature you will get a list of up to 100 errors at a time if there are errors. There are many different types of errors such as product type errors, attribute not value errors, duplicate column errors, and much more. A product type error means that Magento cannot accept that type of product data in the excel format. In this case, if you go to lines 23 and 24 in the CSV file, which refer to rows 22 and 23 because the first row of the excel is skipped due to the column names of the attributes, you will see two products that are bundled and downloadable which are product types that cannot be imported via the Magento import feature. By going to the row that has the error you will be have to identify what columns within that row are causing an error. In this case it is the type column that has two product types the Magento import feature will not accept. Once you have fixed your excel sheet, import the data again and see if you still have the same errors. One of the best things about the import feature is that you can append data that is already in your product database rather than recreating the entire product data set. What this means is that if you want to bulk update the value of certain attributes for certain skus you can do this with the excel without compromising or changing any other data. In this case below you could just update the skus description if you wanted to add new or updated existing descriptions to skus in your Magento eCommerce store. Make sure you select append data when doing this and do not choose the drop down for delete products or replace existing product set! I know there is a lot that I did not cover here for the sake of limited time that I have. Please comment if you have questions about the Magento import feature that you do not understand. You have nailed it all about Magento Product import, But this is related to earlier magneto version now lot of online retailers are moving towards Magento 2. A very detailed post on Magento Bulk Product Upload. Will help a lot new Magento developers even experienced ones also. Thank you for a detailed article. We are managing thousands of products and your tips saved our time greatly. We also have custom options uploading via files within this magento 2 custom options plugin. Hope my advice can also help with exporting or importing product options. This one is really a very detailed article Isaiah Bollinger. Thanks for sharing such posts. Keep up the good work. Hey, just wanted to say a genuine thanks, I read your guide, came back to it, used it, and instead of manually uploading 1060 products, I managed to do it all with some excel wizardry (Well technically I used Google sheets and a some CSV conversion software) – Plan to publish an example of the success I had with it on tech-mag.co.uk , will give you a shoutout! I am uploading a large number products. The upload runs perfectly but Magento is not adding the file extension to the url_key. So none of the products uploaded have the “.htm” file extension. Even after indexing. I’ve tried everything I can think of to resolve this. I’m using version 1.9.4. This is driving me crazy. Great article thanks. I just have one question I cannot find the answer to. I want to bulk import some new products to an existing Magento store with products already on. Can I import a csv file with just the NEW products on without affecting what is already there or do I need to add my NEW products to the end of a csv with the current products already on? GREAT ARTICLE! I want to make a bunch of changes to an attribute (drop down) via CSV. the existing data (empty fields are ignored). How can I overwrite a field with data to be empty? I tried using but got invalid entry errors. Its possibly the site is timing out because you are uploading such a large file. Perhaps split up the file into smaller amounts. I have 71 products in CSV but only 24 records updated(Import) others images and inventory not updated. Hi, if I have a database with 3000+ products from our supplier, is there any way of auto-formatting the data correctly to fit in the CSV without us having to copy/paste columns – or at least keep it to a minimum? If not, what would be the most efficient and quickest way of formatting data – is there some sort of macro that anyone knows of that we could use? Unfortunately I am not sure there is any easy magic solution. 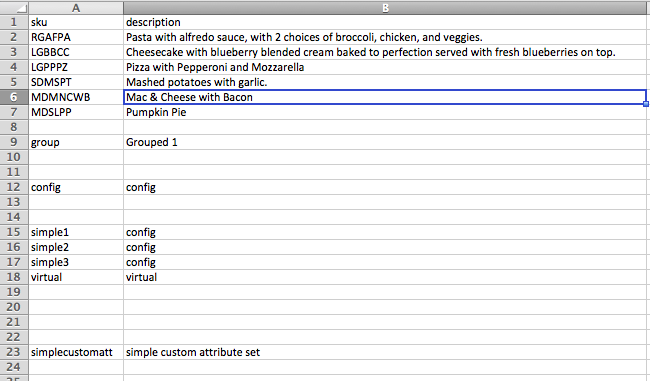 I would simply map the magento import columns that make sense for the different data points manually. 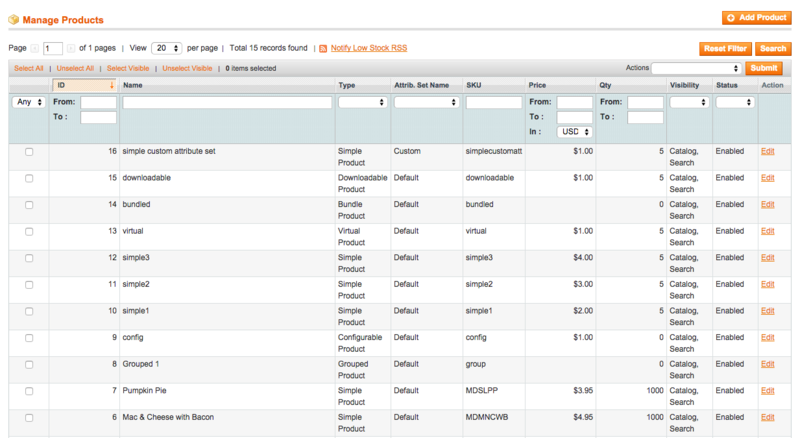 You can also look at Unirgy rapid flow, a Magento products import extension that makes it a bit easier. I am not sure there is anyway around manually mapping the columns to the create attributes as well as creating the custom attributes you will need to create. I am trying to sync my inventory between Quickbooks and Magento for the first time. I used your steps to export my inventory quantity from an excel sheet using just 2 columns: sku & qty. For some reason whatever quantity of the product at the top of the excel sheet is, becomes the quantity for ALL other items. I have tried adding a third column,_type, to try and link the sku and qty stronger but it still is not working!!! HEEEELPP! I should probably mention that ALL I’m trying to get is the quantity of products in stock, nothing else. I didn’t see a mention of ftp, which is great because my site is hosted via a VPS and I don’t know how to bulk upload products on Magento via VPS. Does this tutorial explain how one can upload products in bulk in Magento without doing it via FTP? Yes this is meant for uploading products via the admin import tool using a CSV file. I want to import data from non magento database as csv files. Is it possible? I am trying to upload products from an excel spreadsheet. I had a question on the spreadsheet itself. Is it important to maintain the same order of columns.. I mean, first SKU, then Category id, then so on and on. what happens if we move a few columns (which are not updated on a regular basis) towards the end? I believe you should be fine to change the order of the columns as long as all the data is correct. So are you saying you have 5 in stock and your excel says 5 because you have 5 new items? Then you should simply put 10 in the excel next to the sku. I am confused as to what you are trying to do? If you append the data you will overwrite the qty value in Magento for that specific value / field. We have tried to edit the CSV sheet and imported it on to the magento. Still we could not find a way to add the images, the product description and rest of the details are working except the image. Please help us out. Any ideas of uploading photos? I have spent over 10 alone trying to upload photos… the best I can do is get what appears to be a successful photo upload in the admin backend when viewing the product profile… but when I mouse over the icons for image, small image and thumbnail they all collapse…. 10 hours and counting … I have tried everything. I have manually created a product with photo and the photos shows, but import doesn’t work … I am even using one of those $99 extensions that is supposed to make import/export easier… I know about the import folder. I have asked the author of the $99 extension for help and get generic no help answers. whats even more interesting – I found a magento discussion on one of the big magento forums where folks were talking about this stuff and right when the discussion was getting into the nitty gritty of how to figure this stuff out.. the moderators shut down the discussion stating the questions were “too low quality” …. makes you go hmmmm? Then you need to have the correct file name in the excel file for the thumbnail, media, and small image associated with each sku so it can associate the correct image file with the right sku. I want to know is there any way to know that we can identify which row/product is not get imported. I believe if you use the Data profiles import method you can see what rows are failing. I think your best bet would be to just manually uncheck them in bulk in the categories – category products tab. However, if you have tens of thousands of products you could also replace existing entries in the import feature and have them all go to a root category such as the default category that you do not use and it will replace all entries that you do not want if that is what you are trying to do. Why do you want to bulk clear the data? You could just replace the entries if you want new category data. 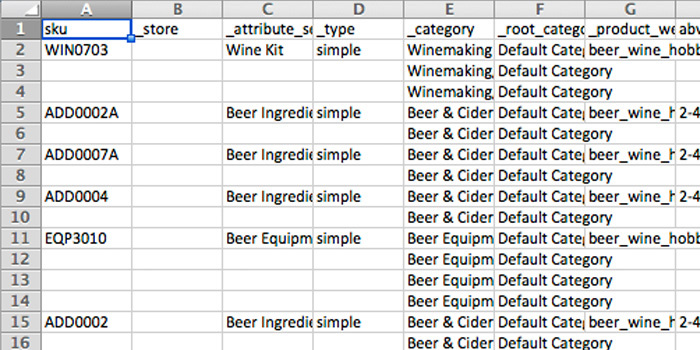 Just make sure you only upload a csv with Sku and _category so you don’t replace other data! I want to update my product information like website , category, etc ,..
how can i do without deleting the bulk of products. Deleting the existing more products by randomly(deleted product’s sku is not same as mentioned in csv file, it is differ). If you upload a CSV via the normal import method in the admin of Magento you can simply “append” the data and not delete and products or data. It will simply overwrite the product data with any new data that is in your CSV that is different from what data is applied to the current products. I used this process to do a batch editing of products descriptions and it worked great for that purpose, but the problem is that I lost the link to all pictures during the process, as the image radio buttons for Base, Small and Thumbnail switched back to the “No Image” position. I had to go back and fix them all manually. Is there a way to stop this from happening in the future? Or batch switching them back if it does happen? Thank you and best regards! Are you saying that the images for your products disappeared? If you export your product data via csv its going to pull the wrong url for the images fields based on the caching system of Magento. If you only want to update descriptions I would just do a column for sku and description and nothing else, so nothing else changes. To update images you need to have the proper url of the images and the images must be in the proper import folder in the Magento folder structure which is different from the caching folder structure. Unless I am misunderstanding and you are saying that there are links in your descriptions that changed? What happened is that the settings on the “Catalog/Manage Products/Product Information/Images” screen where changed. Whereas originally my images where selected for Base Image, Small Image, and Thumbnail, the selections were switched to “No Image” and had to be fixed manually one at a time. The urls were not affected. I thought I needed to re-import the full spreadsheet for updates to work properly, thanks for letting me know that I only need columns for the skus and whatever fields I’m changing. You do not need to re import the full spreadsheet for updates to work properly, in fact I would recommend against this unless you were trying to change most of the data for all the products. Appending the data is simply updating any new data that changes in the spread sheet, you are not adding new products. So in your case you can just upload a csv with sku and description only. You can do this for any attribute you want to update in bulk via csv as long as you are appending data. As I Mentioned the urls in the exported sheet for images are not the right ones for importing which is what caused your problem. Moving forward you need to delete the images columns so that you wont overwrite the images again. I would just upload only the columns and data you need to change. Images are more complex to upload, I may have to do a separate tutorial / blog to explain that better. If you have already added many products manually and want to start adding via bulk upload- hi can you be sure you won’t erase products that are currently existing? Make sure you select append the product data and not replace. The default import behavior is set to append, not replace or delete. Thank you very much for the info, it helped me a lot with the products import. Appreciate you sharing it! we are planning to upload products using “import products” using csv. we have lot of descriptions , we have to display description in table format. is there any way to add html tags in excel sheet. Yes you can use HTML tags just remember you have to use the html tags for things like the register symbol or trademark symbol and other special characters like that.